Havel's popular #11 x-acto-style hobby blades are famous for their longer lasting edge. A bestseller for years! 100 blades per box. Havel's #113 x-acto-style blades match up to the #16 shape and are often used for stenciling, etching and scoring. Individually foil wrapped, 100 blades per box. Havel's popular #172 x-acto-style blades are known for thicker, slightly shorter tips that reduce broken tips. Replacement blade for X-acto no. 11. Individually foil wrapped, one dozen blades per box. Havel's #614 X-Acto-style blades are famous for their longer lasting edge. Compare to the X-Acto #2 and save. Individually foil wrapped, 100 blades per box. 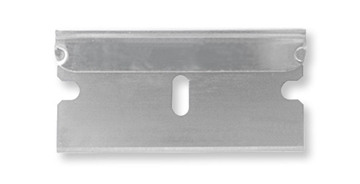 Gem's classic single edge razor blades for heavy duty work. Individually paper wrapped, one dozen blades per box. All metal craft/hobby blade handle with 4 point chuck tightener that accepts the AC614 and Xacto-style #2 blades. One each.